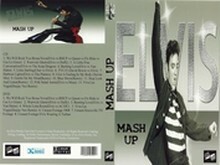 Elvis Mash Up - Mega Rare Elvis Presley DVD/CD-Set! Tags: Elvis, Mash, Up, Mega, Rare, Elvis, Presley, CD/CD, Set! Elvis Mash Up - Mega Rare Elvis Presley CD/DVD-Set! An incredible release! New ideas and new sound!